For centuries, the legend of the Flying Dutchmen has captured the imagination. The story tells how the shades of the doomed ship and its crew are condemned to wander the world’s oceans for eternity without ever reaching land- all because of her captain’s fateful decision to sail into fatal seas. The legend has inspired the imagination of playwrights, poets, and painters. It has even become a feature of the popular “Pirates of the Caribbean” franchise, where the ship is known simply as Dutchman and sails under the command of the fictional captain, Davy Jones. The adoption of the Legend of the Flying Dutchman by popular culture seems perfectly natural. After all, it is nothing more than a fable of the seas, a fairy tale concocted from the superstitious fears of sailors. Or is it? For as late as the twentieth century, sailors have been reporting sightings of the shade of the cursed ship, sailing the seas before them- something they regarded as a warning of impending bad luck or doom. So, is there any truth behind the myth? And if so, what inspired the legend of the Flying Dutchman? In the legend, the ship that became known as The Flying Dutchman was part of the fleet owned by the Dutch East India Company. These ships traveled between the Netherlands and the East Indies, transporting exotic silks, spices, and dyes back to the Dutch ports. At the time of its last, fateful voyage in 1641, the Dutchman’s Captain was a Hendrick Van der Decken. Van der Decken and his crew had an uneventful outward journey. However, the return one was very different. Van der Decken was eager to return to Amsterdam as quickly as possible. So he decided to opt for the shortest route possible around the Cape of Good Hope. However, as the ship began to make its way around the cape, a fearful storm blew up. The terrified crew begged the Captain to turn back. In the earliest version of the story, the Captain, realizing his error agreed but was unable to turn the ship around and back into the harbor. However, in later versions, Van der Decken refused. Some claim that this was because the captain was drunk, others that he was mad. 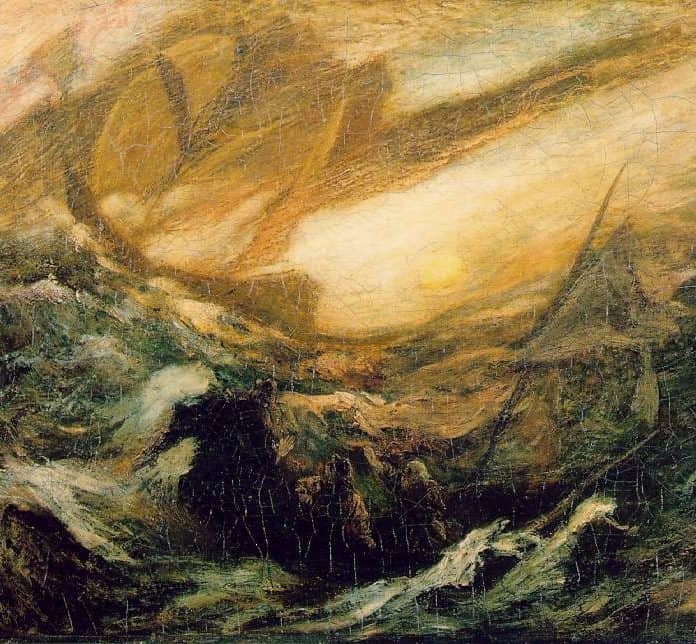 Whatever the reason, Van der Decken ignored his crew and took The Flying Dutchman straight into the storm. Instead of concentrating on battling their way through the maelstrom, the crew mutinied, in the desperate hope they could then turn the ship about out of danger. They failed. Van der Decken killed the leader of the rebels and threw him overboard. As he did so, he declared that he would complete the journey around the Cape even if it took him “until Doomsday.”No sooner had he uttered these fateful words, than an angel appeared. It challenged Van der Decken’s words- and the unhinged Captain repeated them- sealing the fate of himself, his crew and his ship. Another version of the legend places the fateful events in 1680 or 1729. This time, it is no angel but the devil himself who appears before Captain Van der Decken and condemns him to sail the seas for all eternity. However, unlike the angel in other versions of the story, Satan gives Van der Decken a get out clause. He can redeem himself and his ship through the love of a faithful woman. So, every seven years, the Captain was permitted to return to land to search for his salvation. Whether an angel of a demon cursed Van der Decken, the outcome for the ship and crew was the same. The Flying Dutchman was lost in the storm. However, the ghosts of the ship, Van der Decken and his crew sailed on- not just around the Cape of Good Hope but also around the world. The ghostly vessel can be seen to hover just below the waves- or appear from beneath them. Either way, sailors regard a sighting of the ghost ship to be a sign of impending doom.